“PLease write in Punjabi, I can’t read Hindi”. The one-liner in chaste Punjabi spoken with typical Punjabi flourish by Mr Jaswant Kumar, Sarpanch of Karnala, a remote village of Amritsar, may not sound surprising at first glance. THe richest and youngest multi-millionaire Sikh, Mr Reuben Singh (30), is likely to be appointed first president of the 103-year-old Chief Khalsa Diwan (CKD), England chapter. The Guinness Book of the World Records lists him as the world's youngest millionaire. THe state government's plan to run Government Medical College, Amritsar, with the aid from the World Bank has revived the dead hopes of financially-starved medical institute to return to its old glory. Punjab Chief Minister, Capt Amarinder Singh, in a conference at Patiala had recently stated that a proposal was being framed in this regard and modalities were being worked out to accommodate poor patients. IT was a rare occasion for city residents to see Pakistani wrestlers slugging it out against Indian wrestlers in traditional wrestling style here on April 3. The District Wrestling Federation had organised the one-day tournament in the memory of late Inder Pehalwan. PLying of illegal vehicles for ferrying passengers has led to alarming number of accidents almost daily. However, the district transport authorities are turning a blind eye to this. "IF those from the field of science and technology have an idea about developing something, they should pursue it without getting disappointed by negative views of others," says Dr Avtar Pall, founder of friction dampers for seismic control of buildings which have proved to be a major breakthrough in constructing earthquake-resistant buildings. MAta Dhanwant Kaur Dharamshala, which is in the periphery of Shree Durgiana Temple, has been a symbol of communal harmony, apart from providing shelter to devotees at nominal rates. A garden in the residential locality of Rose Avenue is the bright spot for people living in the small colony behind the intersection of Maqbool area and the Mall Road. VErsatility is the hallmark of some persons. Mohinderjit Singh, who is an architect, engineer, playwright and poet, is one of them. This multi-faceted man is a painter and sculptor, too. Carrying on the legacy of his famous father Dharam Singh Engineer, he has the unique distinction of designing a large number of beautiful houses, commercial establishments, hotels, nursing homes, open air theatres, industrial complexes, educational institutions and multi-storey buildings and housing colonies, besides being the major designer for Guru Nanak Dev University buildings. TIny tots from various junior classes presented a colourful programme during the 3rd annual prize distribution function of Sri Guru Harkrishan International School here. From Malwai gidha to bhangra bonanza and a musical narration of Punjab's rich cultural heritage, the school students kept the audience spellbound with their performance at more than an hour-long glittering function. BAtala Road became the hub of textile units after the 1950s. The industrial units were set up in this area due to its proximity with the city. The development of industry here has its roots in the "exodus" of industry from Chheharta, a flourishing industrial area that faced huge labour problems that led to the closure of the industrial units. IN a novel way to commemorate the fourth retirement anniversary, about 50 former employees of Punjab and Sind Bank (PSB) gathered on the night of April 3. IT was truly a homecoming for Guru Preeti Hari, fondly known among her followers as Anandmurti Gurumaa, to deliver discourse from March 31 to April 4 here. “Please write in Punjabi, I can’t read Hindi”. The one-liner in chaste Punjabi spoken with typical Punjabi flourish by Mr Jaswant Kumar, Sarpanch of Karnala, a remote village of Amritsar, may not sound surprising at first glance. But the moment you come to know that this sarpanch is of Bihari origin, the message is nailed home. People from Bihar are an integral part of the holy city and their contribution to the city cannot be ignored by any means. “Hindi tan hun sardaran de bache parde ne” (Now it is up to Sikh children to understand Devnagri, as they study in public schools),” he quips. He also refers to some reputed schools in the holy city where students are punished for speaking Punjabi. Biharis rule the roost in cluster of villages here, which are frequently visited by senior leaders of various political parties, including Mr Parkash Singh Badal, President, Shiromani Akali Dal, and even the current Chief Minister, Capt Amarinder Singh, especially during elections. The sarpanches of Karnala (named after a big landlord Karnail Singh), Dayalpur (of Dyal Singh), Patalpuri, Kharaswala and Galowali – are of Bihari origin. The labour from Bihar was brought by the British to lay the railway track and build the Kathunangal Canal. Most of the labourers decided to settle in Punjab. “We have forgotten our roots in Bihar and have become permanent settlers of Punjab for the last five generations,” says Mr Ramesh Lal. The decade old militancy had no effect on this “new generation of proud Punjabis”. 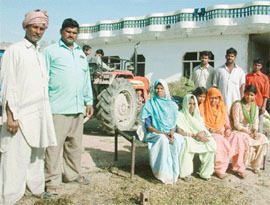 Today they are proud owners of big houses and all modern facilities, including tractors and motorised fodder cutters. This speaks volumes about the hard work put in by the five generations. The votes of these villages, where all sarpanches are of Bihari origin, are considered crucial, especially during the assembly elections. Politicians make a beeline to their villages to demand votes. Mr Krishan Lal Bhagat says that most of the “Purbias” (of Bihari origin) are affluent enough to afford good schools for their wards. Some of them have got jobs in army, railways and Punjab Electricity Board after acquiring good education. “Our forefathers had come to Punjab penniless, but with unparalleled hard work, they became prosperous. Now their villages have scooters, sleek motor bikes and tractor-trailers,” says a sarpanch. The contrast is visible from the fact that many marginal farmers of Punjabi origin could be seen in the labour chowks of Amritsar, while the hardworking Biharis now own big farm houses in these villages. This has broken the myth that it was the residents of Punjab who had converted the arid land of Bihar and Uttar Pradesh into a cultivable land. The fact remains that the persons of Bihari origin had scrapped the sand dunes to convert the barren land of this area into fertile land in these villages. The illustrious and brave ‘Punjabis’ (of Bihari origin) have shown their skills, style and ingenuity in every single area of work. Though Punjab’s economy is now in the doldrums, yet labour continues to flock to this part of the country. Those who have made Punjab as their ‘first home’ have added a new dimension to its culture and to the overall development of the region. The fatherless, 29-year-old Tippu of Bihari origin, who was born in Nepal, has earned the distinction of becoming the “Bagbani Guru”. His mother lived in a slum near the local railway station, before she came in contact with Prof Baghel Singh, owner of the biggest plant nursery of the district. Prof Baghel Singh decided to bring up the child in his own way. Though Tippu has never been to any school, yet he knows the botanical names and popular names of all plants. From his chaste Punjabi, no one can make out that he belongs to Bihar. Prof Baghel Singh, who had a stint as a lecturer in local Khalsa College and has done research in producing new varieties of plants, calls him “Tippu Sultan”. Tippu, however, takes pride in his Bihari roots. He asked this correspondent that his name be written as “Tippu Pawan”. Prof Baghel Singh bore the expenses of Tippu’s marriage. He has also been organising lavish parties to celebrate the birthdays of the two sons of Tippu. In return, Tippu has given a promise that he would remain with his master, Prof Baghel Singh. Prof Baghel Singh says that Tippu is the overall in charge of the nursery and more than 50 labourers work under him. Interestingly, Prof Baghel Singh calls Tippu as his master in the field! The CKD president, Mr Charnjit Singh Chadha, who returned from ten-day tour from England told TNS that Mr Reuben Singh had accepted the proposal and would be visiting Amritsar the next month. He said Mr Reuben Singh would be nominated as an honorary member before he was made president of England chapter. The general body meeting of the CKD would be convened shortly for seeking formal approval in this regard. Mr A.P.S. Chawla of England would be one of the 11 office bearers of the CKD in England. It is for the first time that the CKD is establishing its units in Sikh-dominated countries of the world. He said Mr Chain Singh, a senior Sikh leader of France, met him in Paris and desired to open a unit of the CKD there. Similarly, Mr Shamsher Singh of New York had given his consent to set up a unit of the CKD in his country. Mr Reuben's parents had migrated to England from Delhi in the early 1970s. They ran a profitable Manchester-based company that imported and distributed fashion accessories. Today Mr Reuben, who is a devout amritdhari Sikh and counts visiting the Golden Temple in Amritsar every birthday, operates flourishing business empire worth over 100 million dollars and says that his next aim is to become another Bill Gates. He says, "The Guinness Book of the World Records lists me as the world's youngest millionaire, but the very next entry is Bill Gates, youngest billionaire." If it happens it would be of great benefit for students who usually complain about lack of proper facilities. Earlier, it was alumni of the more than half a century old medical college under the banner of the Amritsar Medical and Dental Alumni Association of North America (AMDAANA) that came forward to develop the infrastructure and the standard of education at the college by bringing the students, the faculty and the authorities together to work for its uplift. The association assured to renovate five lecture theatres at the college, besides providing some more facilities. Once renowned all over the world, the college fell to bad days during the peak of militancy, which was its worst phase for over a decade. After that, the indifferent attitude of the consecutive governments failed to revive the golden history of this medical college. 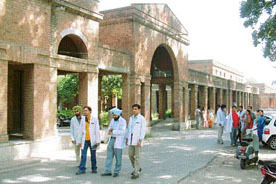 Started as a medical school in 1864 at Lahore, shifted to Amritsar in 1920 and upgraded to Medical College in 1943, the region's premier institution produced the first MBBS batch in 1949. The college expanded by adding V.J. Hospital, Ram Saran Dass Parkash Wati Kakkar Children Ward and Family Ward, T.B. Sanitarium and Ram Lal Eye and ENT Hospital — all at different locations. In 1969, Guru Nanak Dev Hospital's foundation stone was laid. Patients came from all over the region. Some of the best doctors of this region and many settled abroad are products of this institution. Politicians and bureaucrats have financially starved Amritsar's Medical College and stifled its growth, allege observers. The medical colleges in the state are run by remote control from Chandigarh, they add. "All powers are centralised. Cumbersome procedures delay the release of funds. The hospitals sometimes do not have funds to pay their power bills. Shockingly, the principal and the medical superintendent have financial powers of only Rs 500 each," explains an observer, adding that the heads of departments have no financial powers. Today, the college does not have proper staff. The majority of posts are lying vacant. This drastically effects the quality education. It is suffering on many accounts, including outdated machinery, lack of equipments, dilapidated condition of library, which has not received any journals since 1991. The college is also faced with the challenge of declining patients in various hospitals run under medical college. The college has no basic machinery required for medical testing. The hostels, canteens and green belt in the college are also in poor shape. Dr Satwant Singh, founding president of AMDAANA, who had recently visited the medical college said that he was pained to see the deteriorating condition of the institution. He said the college was among the three top medical institutions in the country but it was not even the first priority of the bright students in Punjab. Dr Satwant Singh said that it was the plan of AMDAANA to link the medical college to the University of Cincinnati. Dr A.S. Padda, officiating Principal of the college, said that if such a proposal was accepted, it would greatly help the once prestigious institute. He said they would be able to have the latest equipments and could compete with private sector, besides providing quality treatment to the patients. Leader of the nine-member team, including six players, Mr Abdul Majid, said it was the best part of their month-long tour to Punjab as they played on soil here. He said the akhara tradition, which was fast fading in oblivion, needed to be maintained. He opined that both countries shared the same tradition of akhara. He said the modern age had eclipsed this age-old tradition. Citing an example, he said that a small country like Japan had entered its two games judo and sumo in the Olympics. While India and Pakistan with their combined population of nearly 1.25 crore had failed to incorporate their common games like kushti and kabaddi. Making a comparison between wrestling in Indian and Pakistani Punjabs, Mr Majid said mats had been introduced swiftly here. He said introduction of mats was at slow pace in his country. However, efforts must be made to maintain the tradition, he added. Pakistanis dominated the one-day tournament. As many as six bouts were played on soil, out of which four were won by the visitors. The Kartar Singh Wrestling Stadium, Gol Bagh, was packed to its capacity. From Pakistan Taj, Shahid, Javed and Pappu won their matches by beating Lali, Jang Bahadur, Vikram and Sukhchain, respectively. While Ramphal and Padarth of India thrashed Goga and Yusuf, respectively. Prof Darbari Lal, local MLA and president, District Wrestling Federation, distributed the prizes among winners, while Mr Kartar Singh, Director, Sports, Punjab, presided over the tournament. Mr Majid said that in his report to the Pakistan Wrestling Federation he would advocate for the frequent ties in the game to give enough exposure to the players so that they could raise the standard of the game. He said it would prove vital for the subcontinent players in the international events. The recent accident that killed 19 persons, including 11 women and 4 school students and left many others seriously injured near dera Beas on April 1, has allegedly exposed the nexus between illegal vehicle pliers and officials. According to world figures, 65 per cent of accidents occur due to human error. However, 'road-story' in the rural hinterland here offers startling facts that may have no international correlates. Lack of regular public transport in villages has led to the emergence of indigenously-fitted "contraptions" that are powered by diesel engines and a local-made chassis. Called jharokas, marutas, these vehicles allegedly have a poor brake system and also many times they are without headlights and rear lights. Vehicles meant for goods are increasingly used to transport animals and passengers, using wooden planks to accommodate more animals and people. These vehicles include trucks, canters, mini-trucks, dodge vehicles (condemned during World War II). Trucks and buses, too, indulge in illegal plying. Passengers are loaded on vehicle tops. Mr Bhupinder Singh, District Transport Officer, had said that they were impounding dodges and jharokas (indigenous trucks) almost everyday. He had further said that after impounding these vehicles, SHOs were directed to dismantle them to stall their further use. However, the measures seem to be insufficient in view of the fact that many such vehicle owners and drivers bribe their way through officials. Also, these vehicles blatantly use pressure horns while indulging in reckless driving. Mr Brij Bedi, president, Citizens' Forum, an NGO, has often taken up the issue with the administration. He has been urging the administration to challan these illegal vehicles and trucks and buses for creating noise and air pollution. "Overloading of passengers has become a major source of concern. Rules and regulations are being thrown to the winds, as no check is being initiated to ban the plying of illegal vehicles," says Mr Bedi. Besides this, "killer-road" patches and crossings have added to the number of accidents. The highway from where the international Sada-e-Sarhad bus from Lahore takes a daily detour is neither barbed on either side nor divided, and it has numerous crossings with signals that remain non-operational for most of the time. A report of the National Highway Traffic Safety Administration says that drunken driving, road rage, poor traffic sense, use of cell phones while driving, stress, not adhering to safety measures, absence of use of helmets and seat belts, all contribute to accidents. However, in rural areas the causes of road accidents are different. The rural ingenuity, combined with other factors, gives the rural areas the unenviable distinction of having a high accident rate. These friction dampers can bear massive shocks of earthquake, preventing the buildings from collapsing and saving many precious lives. Dr Pall was here with a Canada trade mission that would meet Mr Kamal Nath, Union minister for International Trade and Commerce, at New Delhi. Dr Pall hails from Hoshiarpur district. He said the idea of making friction damper was in his mind when he worked as section officer at the age of 17. A diploma holder in structural engineering, he completed his degree from the AMIE. He also worked at military engineering services (MES) for quite some time. However, in absence of proper testing facilities and technology, he went to Canada in 1975 to pursue his graduate studies. Dr Pall said the authorities of Concordia University, Canada, helped him and allowed him to pursue the idea. He said his 12 years' research was completed in 1987. He said the friction dampers were finding increasing application worldwide for new construction as well as for retrofit of existing buildings. He said his company had worked in more than 90 major buildings all over the world, including Canada, the USA, China, Iran and India. These included the Boeing Commercial Airplane factory in Everett, Washington, the world's largest building in volume. His dampers had also been installed in the Canadian Space Agency headquarters in Canada. The friction dampers had gone through rigorous testing both in Canada and the USA before being practically used. His innovation was awarded the "Raymond Reese Research Prize" by the American Society of Civil Engineers for outstanding contribution to structural engineering. In 1985, he also received the Canada Innovation Award and in 1987, he got the Canada Award of Business Excellence. Explaining the concept of friction dampers, he said friction dampers reduced building oscillations during strong earthquakes by absorbing 80 per cent energy of the earthquake and thus mitigated damage to a structure and its contents. He said it was not earthquake that killed people, it was the falling buildings that trapped people inside. Dr Pall said this system was being used widely in earthquake-prone regions like North America. He said he wanted to do something for his country also and he was ready to provide this technology under technology transfer programme to India. He said India should manufacture dampers here, as it would be expensive to import them. He said talks were on with certain corporations in India. He said these dampers could be used in buildings in New Delhi, Gujarat, Assam. He added China had shown interest in friction dampers. There is also a philanthropic side to his personality. He has started three scholarships in Concordia University, University of British Columbia and University of California at Berkley. He contributes 25 per cent of his income to these scholarships. He said these universities had helped him a lot and he wanted to pay back to them. Mata Dhanwant Kaur Dharamshala, which is in the periphery of Shree Durgiana Temple, has been a symbol of communal harmony, apart from providing shelter to devotees at nominal rates. This is a unique example that a lady who was born and brought up in a Sikh family preferred to donate the prime building to a Hindu shrine. Mata Dhanwant Kaur, who belonged to Rai Bahadur family of Lahore, got the dharamshala built and donated to Shree Durgiana Temple in the year 1945, two years before the Partition. The dharamshala has a big hall and 41 big and small rooms, where about 450 to 500 devotees can stay. The Shree Durgiana Temple Management Committee (SDTMC) runs the affairs of the dharamshala. Devotees can stay there for a maximum of three days and Rs 15 is charged per person per night. Bedding is also provided by paying extra. People who cannot afford high rates in the market for social functions like ring ceremonies can arrange such functions in this serai by paying a sum of Rs 100 only. A large number of devotees visit Durgiana Temple from far off places, and Mata Dhanwant Kaur Dharamshala makes their pilgrimage comfortable. Durgiana Temple was the brainchild of Guru Harsahai Mal Kapoor, who was a great visionary and missionary. The foundation stone of the temple was laid by Pandit Madan Mohan Malvia, a political, social and religious stalwart, in 1925. Over the years it has become an epicenter of Hindu renaissance and rejuvenation. Lakshmi Narayan Temple is the central place in the Durgiana complex. The devotees can have darshan of Shree Lakshmi Narayan in standing posture, which occupies the central pedestal in the temple. Ram Darbar can be seen on the left niche, while Giriraj Ji Maharaj can be seen on the right. As we move to the back of the temple, we come to Har Ki Pauri. A part of the holy sarovar bays into the temple. The interior of the Lakshmi Narayan Mandir and Darshani Deori is as per the Indian traditions of art and design. The mural paintings on the walls of the temple belong to the Kangra School of art. The temple has gold-plated domes and spires. Rose Avenue was developed as a small 50-odd-house colony in the seventies. But today, the surrounding park has become a place for everyone to relax play and enjoy the colorful and blooming flowers. The spring season brings a riot of colours and greenery to the garden, much to the delight of people living in this posh and expensive area. It was the community effort which contributed to make the "well- groomed" park. The residents of the area contribute more than Rs 300 per month and engage more than 10 gardeners to maintain the park throughout the year. Initially, the residents' welfare association used to rent out the park for marriage and other ceremonies and charge for the same, but lately the association has decided not to let it out to outsiders for any ceremony. Mr Jugal Kishor Khanna, Mr Narinder Kumar Jain, who have been living in the locality for the last more than two decades have been instrumental in turning this area into one of the most admired initiatives in the holy city. Presently, the entire landscaping, greenery and flowering of the area has been handed over to a homemaker, Ms Reva Khanna. She has appealed to all householders to contribute liberally for the maintenance of the green areas. Recently, she undertook a major project to green the sidewalks. The welfare association spends more than Rs 2 lakh annually to maintain the park and its irrigation system. The money is collected through voluntary donations and monthly charges from the members. Versatility is the hallmark of some persons. Mohinderjit Singh, who is an architect, engineer, playwright and poet, is one of them. This multi-faceted man is a painter and sculptor, too. Carrying on the legacy of his famous father Dharam Singh Engineer, he has the unique distinction of designing a large number of beautiful houses, commercial establishments, hotels, nursing homes, open air theatres, industrial complexes, educational institutions and multi-storey buildings and housing colonies, besides being the major designer for Guru Nanak Dev University buildings. He has been on the expert panel of the varsity for the last couple of decades. He has been consultant architect since 1963. He remained member of the governing council of Khalsa College and president of the Indian Academy of Fine Arts here. He has designed many buildings abroad also. These include buildings in Indonesia, Singapore and Bhutan. Many buildings in Guru Nanak Dev University, including Guru Nanak Bhavan, Sports Complex, Maharaja Ranjit Singh Bhavan, Guru Nanak Heritage Centre and Teachers' Holiday Home at Dalhousie have also been designed by him. The designing of Lal Rattan cinema hall in Jalandhar and Sangam Cinema here has been done by him. He has also the unique distinction of designing and constructing huge visitors' gallery on the Indian side at Wagah check post. A war memorial for the Punjab Armed Personnel at PAP, Jalandhar, too, is his creation. Mohinderjit, who has also worked as consultant architect with municipal corporation here and with many leading construction companies in Bhutan and other countries, has also served as lecturer and later as visiting professor in University of Roorkee, Uttar Pradesh. He says that he believes that form follows function and that buildings should be beautiful from outside and comfortable from inside. Before starting any design, he keeps these simple points in mind. Painting and sculpting have been his childhood passions. He said balance and proportion had to be taken into consideration while designing these items. His paintings, which received critical acclaim, include composition, night bird and woods. He juggles words to form beautiful poems and short stories. Besides Ehsasa, he has five books to his credit. These are Daab, Chetna Da Ik Pal, Sach Di Bukal Vich, Kach Tutda Hai and Eati Maar Pai. 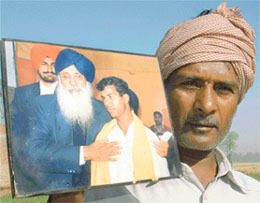 He was awarded Bhai Mohan Singh Award for Eati Maar Pai, a book of short stories. He was honoured with gold medal by the state government on August 15th, 1995, at a state level function. He was also honoured by Guru Nanak Dev University and DAV College. Chairman of Improvement Trust, Mr Jugal Kishore Sharma, gave away prizes to the winners, while Mr Charanjit Singh Chadha, president of the Chief Khalsa Divan (CKD), welcomed Mr Sharma and gave a brief account of the future plans of the CKD which included setting up of more educational institutions. Vice-president of the CKD, Dr Santokh Singh, thanked the gathering and the guests. Principal of the school, Ms Hardeep Kaur, read out the performance sheet of the school in the last academic year. The deputy general manager of the Oriental Bank of Commerce, Mr Ashok Verma, said that the bank was willing to undertake the initiative to make women self-reliant. These women could set up their small businesses through the bank's cheap interest schemes. Addressing the 33rd monthly Chinmaya Mission Widow Ration Distribution function held here recently, Mr Verma said the bank had excellent schemes to offer to the widows and that the bank would provide financial help to them. He added that the bank would encourage them to form small groups to manufacture household food items. He said the bank would also make them aware of the benefits of thrift schemes. Earlier, the director of Spring Dale Senior School, Dr Shivinder Singh Sandhu, offered a donation of Rs 21,000 for the widow ration scheme. Dr Alka Gupta, a dental graduate of the Sri Guru Ram Das Institute of Dental Sciences and Research, has topped the post graduate entrance test for 2005 admission to the MDS courses. The examination was conducted by the Baba Farid University of Medical Sciences. Dr C.S. Bal, Principal of the institute, said that two more students, Dr Ashish Verma and Dr Anantpreet Singh, had secured the fourth and the seventh positions, respectively. The American Diabetes Association, USA, has selected the research work done jointly by Dr Rohit Kapur, MD Medicine, and Dr Atul Kapur, MD Radiology of the Advanced Diagnostic Centre here. The work deals with the prevention and the early detection of heart diseases in diabetics. The doctors had been conducting this research for the last three years and had also presented their work in International Diabetes Federation Congress held in Paris in 2004. A Lok Adalat to resolve labour disputes would be held here on April 22. The additional district attorney, Ms Ritu Jain, in a press note issued here, said that the labour court would be presided over by additional district and session judge, Ms Harpreet Kaur Jeevan. She said the complainants, who wished to settle disputes through the Lok Adalat, should apply by or before April 18. The Amritsar Vikas Manch (AVM) elected its new office bearers in its general body meeting held on April 3. Mr Charanjit Singh Gumtala was elected its new president, while Mr Amrit Lal Mannan was appointed the general secretary. The meeting was held under the chairmanship of Prof Mohan Singh. According to Mr Tirlok Khanna, president, Textile Manufacturers' Association, his processing unit had been at Batala Road since 1939, and he had seen the entire gamut of industrialisation of the area - its failures and its resurgence. The area produced some of the finest woollen fabrics, blankets, shawls, stoles, as well as curtains, lace, suiting and dress materials. Ninety per cent of the large textile processing units were installed here during the textile boom of the 1960s-70s. However, only three units survived, owing to competition from Surat and Mumbai fabrics that were better in quality and lower in price. There had been no reprieve from the government, contended Mr H.S. Makhini, general secretary of the association. "Besides this, the government has failed to lift the textiles from the negative list of Pakistan that closed all trade options for textiles in the neighbouring country," he added. The failure of the government to honour its subsidy conditions, too, played a spoilsport. 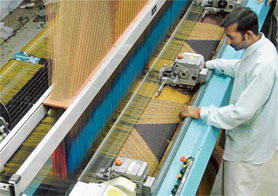 "Out of hundreds of warp knitting machines set up here, only about six or seven power loom weaving units are left. The decline came as government imposed various taxes, including entry, excise, terminal taxes, on raw materials," he explained. The different excise tax slabs for 'composite' and 'independent' units, too, led to the downfall, as overhead costs plummeted. The non-implementation of subsidy, as announced by prime minister, served no better. The removal of quota restrictions from January 1 this year, too, has thrown a new challenge to the industry. The imposition of CenVat has already taken a toll on small-scale weaving units. "The need of the hour is to speed up the implementation of progressive policies. The competition from textile goods from China, Korea should not be overlooked," pointed out Mr Makini. The celebration was arranged under the aegis of the PSB Retired Officers' Federation, an organisation formed to look after the welfare of former employees. The event has become an annual affair with the employees who took voluntary retirement four years ago under the Voluntary Retirement Scheme. The function took off with the honouring of former employees who had completed sixty years of age this year. These included Mr Amar Singh Kaler, Mr G.S. Joshan, Mr Sadhu Singh Chheena and Mr T. S. Mahal. The former bankers danced to the tunes of the latest Punjabi numbers. Mr S.B. Singh and Mr Manjit Singh Bedi rendered songs on the occasion, while Mr Gurpreet Singh regaled the audience with his jokes. They also decided to celebrate Divali and the New Year together every time. Earlier, Mr Gobind Singh, president of the organisation, in his inaugural address, resented the denying of benefits like medical allowance, concessional interest rate on loans, concession in locker rent fee and leave travel concession to retired employees. He appealed to bank authorities to extend these benefits to the retired employees. Born and brought up here, she rose to become a religious preacher of national repute. The five-day discourse here saw thousands of believers thronging the Ram Bagh garden to listen to her views and have a glimpse of her. The convent-educated 38-year-old Gurumaa, while talking to this correspondent, said that she did not deliver her discourse based on any one religious belief or scripture.